Nintendo 2DS Review: Should You Buy It? A writer/gamer who has been writing about video games and media for more than 10 years. 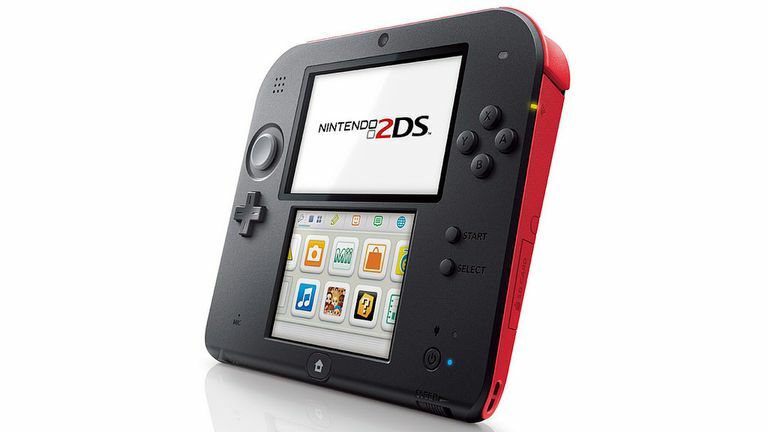 The Nintendo 2DS is an alternate model of the Nintendo 3DS. It was designed specifically for younger players, which is evident by the system’s tough design, tablet-like shape, and non-3D display (there is an ongoing debate over whether or not 3D projection hurts young kids’ eyesight). It’s a funny-looking system, but it comes with a lot of benefits. The Nintendo 2DS can play 3DS and original Nintendo DS games; however, games made exclusively for the New 2DS XL and the New 3DS are not playable on the regular 2DS. Which Version of the Nintendo 2DS Is Best? Aside from the extra cost, the major downside of the newer model is that it's easier to break, which negates the purpose of the original design. While there are a few games that can only be played on the New 2DS XL or New 3DS, it's not worth the investment if you already have a regular 2DS. That said, if you don't own a 2DS, then you might as well drop a few extra dollars for the upgrades. Essentially, the New 2DS XL looks identical to the Nintendo New 3DS XL, except that it lacks 3D capabilities. Since the differences between the 2DS models are mostly aesthetic, the information in this article applies to the original version of the 2DS unless otherwise noted. Bargain price. The Nintendo 2DS’s affordable price tag is one of its biggest-selling points. It costs considerably less than the 3DS, and you can likely find a brand-new one for under $100. Even the New 2DS XL is a tad less expensive than the New 3DS XL. Compatible with Nintendo DS and 3DS games. The Nintendo 2DS plays the entirety of the Nintendo DS's and 3DS’s library. You can also download 3DS titles directly to your device via the Nintendo eShop. Access to hundreds of classic games. Download titles for the original NES, Gameboy, and even the Sega Game Gear from the Virtual Console. Mario, Sonic, Pikachu, Kirby, and Mega Man are all there. Good non-3D option. Beyond concerns about children's eyesight and 3D projection, some people are unable to perceive 3D images or are susceptible to motion sickness that 3D images may trigger. The bare-bones 2DS is a good option for such players. Longer battery life. The Nintendo 2DS has a battery life of approximately 3.5 to 6.5 hours, which is comparable to the Nintendo 3DS XL. The regular Nintendo 3DS battery lasts between three and five hours. You can extend the life of any Nintendo 2DS or 3DS battery by turning off Wi-Fi, dimming the screen, and turning off the sound. Better durability. The Nintendo 2DS is a single, solid piece without hinges, which makes it less likely to break. Lightweight and comfortable design. It may look a bit clunky, but the Nintendo 2DS is actually fairly compact and lightweight. It feels good to hold and carry around, but it may take a little getting used to if you typically use a Nintendo 3DS or 3DS XL. Includes a 4-gigabyte SD card. The Nintendo 2DS comes with a 4-gigabyte SD card (located inside the system), which should provide enough room for game saves and a few downloadable games. No benefit of 3D camera. The Nintendo 2DS is capable of taking 3D pictures, but you can’t view the 3D effect on the system itself. Toy-like feel. Though the Nintendo 2DS is comfortable to hold, it is constructed out of matte plastic. This gives the system a toy-like look that may turn off older players. Smaller screens. If you already own the Nintendo 3DS XL, the Nintendo 2DS may be a visual downgrade. Its screens measure the same as the original Nintendo 3DS at 3.53 inches (top screen, diagonally) and 3.02 inches (bottom screen, diagonally). Screens are susceptible to scratching. The Nintendo 2DS’s convenient tablet shape comes with a downside: Its screens are more open to dings and scratches. Therefore, you might want to invest in a carrying case. Carrying case not included. Speaking of which, the Nintendo 2DS does not come with a carrying case. You can purchase one from a game shop, such as GameStop, or through Nintendo’s website. Single speaker. The Nintendo 2DS lacks the 3DS’s dual speakers, so you only get monaural sound. Using headphone remedies this problem. Should You Buy a Nintendo 2DS? The Nintendo 3DS has built up a strong library of must-have games for all ages. If the cost of the Nintendo 3DS is holding you back from ownership, then the Nintendo 2DS is definitely a great alternative. The 2DS is also a good option for younger children if you don’t want them handling your 3DS or 3DS XL. On the other hand, if you already own a 3DS, the 2DS doesn’t offer much beyond novelty. Which iPad Should You Buy? Should You Buy the Nintendo 3DS or the DSi? iPad vs. Android: Which Tablet Should You Buy? Should You Buy the Nintendo New 3DS or the Nintendo 2DS? Should You Buy a Tablet or a Laptop? Is the iPad Pro the Ultimate Family iPad? Is the iPad Mini 4 Worth Buying? Should You Buy a Keyboard With Your iPad? Is Your 3DS Screen Scratched? Which Used iPad Is Best for You: 2, 3, or 4? Are You Buying the Right Accessories with Your iPad?